I moved to Maryland a little over a year ago. It is a great state and has a lot of things going for it, but the alcohol situation in Montgomery County is not one of them. 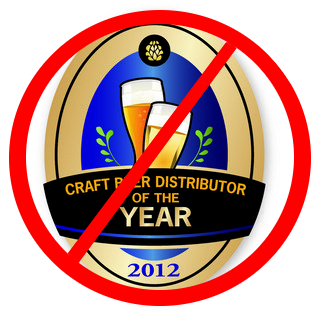 Required Distributor - That state requires breweries to work with a distributor; a company which specializes in selling your beer. Montgomery County - The county buys and sells all products from distributors. There are varied rationale's on whether self distribution or a distributor is better for the brewery as far as opportunity costs and actual costs go. Either way, the third option results in another mark up to the consumer. The county controls which products can be sold and for what price. Bottle shops are forced to take a drastic hit in profit or offer beers at a higher price than other counties in Maryland, but most of all higher than bordering state of Virginia... a craft beer oasis in comparison. Now we know the cause, but lets look at the effect. I have visited a few different bottle shops in my area, and I was actually really impressed with the selection. The problem was the price. I was finding six packs of California based breweries for $15-$18. These sixers were sitting at room temperature and had some visible dust. Green Flash and Firestone Walker make some great beers, but I just don't want to take a chance on their freshness, especially when I would be forking over $3 a bottle. Depending on the shop you could have to pay $9-$10 for a six pack that would be $7-$8 in Virginia. However, the price gouging doesn't stop a the sticker. About a year ago, Montgomery County increased the sales tax on alcohol to 9%. So not only would I potentially be paying 20%-30% more for my beer, I would then have to pay and addition 9% in sales tax. Disappointed to say the least. I am glad my hobby allows me to make flavor beer on the cheap at home. To end this discussion on a positive note, I will say that thankfully there were 4 grocery stores in the county which were grandfathered in. These locations, of which I only am aware of one, somehow have reasonable prices and decent selection. Maybe they get a volume discount, or maybe it is because they are the only grocery stores allowed to sell booze, but they do have reasonable prices. All I know is I go to buy craft beer in the county, I will be willing forking over way to much cash, or going the Shoppers Food Warehouse in Germantown. Yeah, I'd like to open a speakeasy in Montgomery County to serve the finest local homebrew and moonshine. Attracting the right clientele would be the tough part, perhaps I could find some decent country club members, lawyers, judges, and police officers to patronize the joint. Montgomery is a Peoples Republic Club, doing business there often requires forking over generous sums of money to their convoluted bureaucracies, or adhering to excessive permits and controls; Leaving small businesses and their customers gouged.